Consigne : vous montrerez que malgré une tentative de contrôle des médias lors de la guerre du Golfe de 1991, une simple photographie peut marquer un conflit. 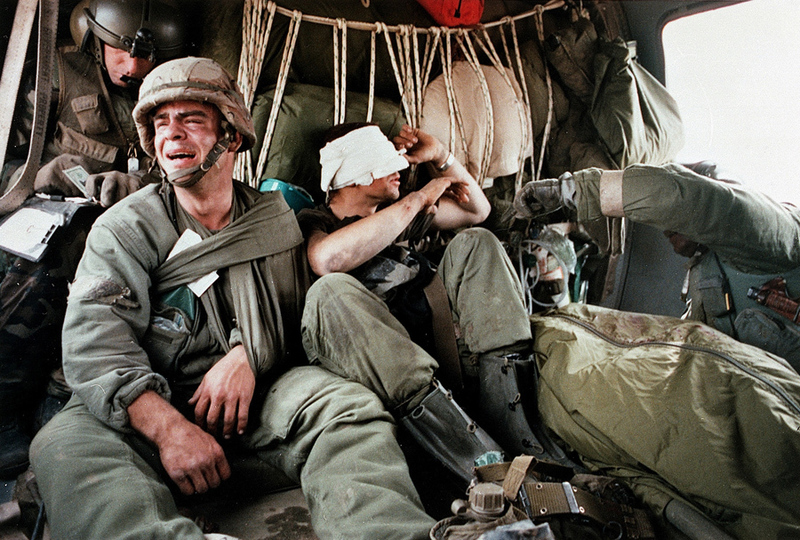 Évacuation sanitaire par hélicoptère du sergent Ken Kozakiewicz (bras cassé), du caporal Michael Santarakis (brûlures à la tête) et du corps du soldat Andy Alaniz, le 27 février 1991. Durant ce dernier jour de la guerre du Golfe, leurs véhicules blindés ont été détruits par un « tir ami » . L’infirmier sur la droite vient de passer à son collègue sur la gauche la plaque d’identification et la carte d’identité du mort : le sergent comprend alors qu’il s’agit d’un de ses amis. Un état-major [américain] qui avait son opinion sur les causes de la défaite passée [celle du Vietnam] : c’était la presse qui avait tout fait. En minant le moral de la nation par ses comptes rendus partisans de ce qui se passait sur le terrain. Le fait est qu’à partir de 1970 les journalistes américains, surtout ceux de la télévision, avec un courage extraordinaire, entreprirent de montrer à leurs concitoyens à quel point cette guerre, si loin de chez eux, n’était ni fraîche ni joyeuse. Les images de blessés gémissants, de corps déchiquetés, tant bien que mal rassemblés dans les fameux « sac de plastique » avant d’être renvoyés par avion au pays, l’air hagard des combattants après des jours et des nuits de bataille dans une jungle terrifiante contre un adversaire impitoyable devaient faire plus pour mettre fin au conflit que tous les discours pacifistes. Si, à l’époque de la guerre d’Algérie, la presse française avait eu les mêmes moyens, et le même courage, le conflit aurait certainement duré moins longtemps. Dans le Golfe, il n’y aurait donc pas de « nouveau Vietnam », en tout cas pour la presse. Le système a été rôdé lors des mini-campagnes de la Grenade (trois jours) en 1983, et du Panama (cinq jours) en 1989. Seuls autorisés sur le terrain du Golfe : une soixantaine de journalistes choisis par le service d’information de l’armée et répartis en « pools » dûment escortés. Interdiction de circuler à tout journaliste ne faisant pas partie d’un « pool », interdiction de parler à des militaires non autorisés par le service d’information ; soumission de tout article, de tout film à l’autorité militaire. Il ne s’agit pas de « censure », ont juré les autorités, seulement du souci de préserver la sécurité des journalistes et de ne pas, par inadvertance, donner des informations à l’ennemi. Nicole Bernheim, « Le débat géopolitique aux États-Unis : une guerre trop bien annoncée », Hérodote : revue de géographie et de géopolitique, n° 60-61, Paris, éditions La Découverte, avril 1991, p. 103-104. I was on assignment with the Detroit Free Press and US News and World Report Magazine. I had originally been dispatched as part of a pool to be attached to the 82nd Airborne as one of the forward-most combat photographers. We were accompanied by a public affairs officer whose job was to make sure we stuck to Pentagon restrictions. This meant we would not be allowed to photograph casualties of war and certainly not war dead. While I was out in the field, I got wind that much of the TV coverage was portraying a kind of sanitised war, one in which big technology was being used but that no human life, and particularly not American life, was at risk. It became clear to me that it was going to be very difficult for me to document the reality of the war. In the meantime, I had encountered an elite MASH unit . I told the head of the unit that although I had misgivings about the war, it was clear to me that this particular unit was going to serve a very vital role in helping people and I wanted to document that. The only challenge he had was that there wasn’t a public affairs officer attached to the unit. I said that wasn’t a problem with me if it wasn’t a problem with him. So I stayed with the doctors and nurses for a few weeks and we developed a trust. On what turned out to be the last day of the war, I joined the helicopter evacuation unit on a mission. A radio communication came in and it was very clear from the expression on the captain’s face that something very different had happened. As we approached the town of Nasiriya on the Euphrates River, we could see that a Bradley fighting vehicle had been severed in two by a missile. Two injured soldiers were loaded into the helicopter - those are the two you see in the photograph. They didn’t seem to know what had happened - they were very disorientated. The body of the driver was put into a body bag. One medic handed over the dog tags belonging to the dead soldier to another medic and, at this point, Sergeant Ken Kozakiewicz realised that his best friend had been killed by "friendly fire". I knew this was going to be a good picture and I wanted to get it back to my editors in Saudi Arabia quickly. My only option was to send the film through the military. I knew there was a risk that they would go into the package and possibly censor the film. It was my worst fear. When I got to Saudi Arabia, I found out that my editors hadn’t received the film. I went to find the lieutenant in charge of these things. He told me the film was being held for a period while the next of kin were informed. I told him that the period had already expired. I knew this lieutenant had been in Vietnam and I said to him : "You know what happens in war and you are actually depriving these men of their due heroism - the fact that they had to risk their lives to fight in this war." The film was released but we were asked not to transmit the pictures until the military got back to us. The editors of all the major magazines and wire services looked at the image and decided it had to be published. It was transmitted and published in every newspaper and news magazine around the world. From the reaction I have received from the picture, I think it resonates on many levels. It is an unbelievably intimate photo. It reveals the vulnerability of otherwise strong men. It is not necessarily a photograph about American soldiers - it’s about war and the young men who go to war. There is a certain nobility and dignity on the faces of these soldiers. I think that Ken Kozakiewicz touches chords that are deeply emotional in terms of his grief and his heroism. There is a certain everyman quality that becomes a very strong icon for the reality of war, which is always a tragic reality. MASH : Mobile Army Surgical Hospital.